This week's top video gained the attention of more than a million CNN.com viewers and featured chilling footage of the Texas tornadoes tossing tractor-trailers into the air. The second most watched video on CNN.com this week was the tragic firsthand account of the Oakland university shooting, followed by video examining Nadya Suleman's welfare application, the crash of an F-18 jet into a Virginia apartment complex and finally the timeline of the Trayvon Martin shooting. 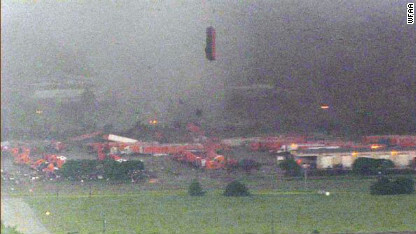 Truck trailers are thrown around violently as a tornado rips through North Texas. Watch the chilling video of a powerful tornado throwing tractor-trailers hundreds of feet into the air as if they were toy trucks. Art Richards shot cell phone video at Oikos University where a gunman killed seven people. A witness describes being caught in the crossfire of the Oikos University shooting where a gunman killed seven people. Watch cell phone video showing the hectic scene during the attack. 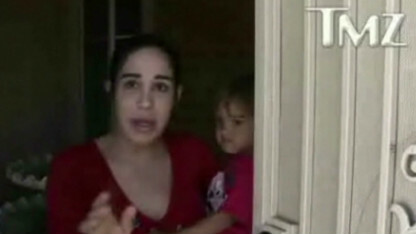 Anger and outrage as "Octomom" Nadya Suleman, admits she's receiving food stamps. HLN's Nischelle Turner reports. Many people were outraged to learn that "Octomom" Nadya Suleman was receiving food stamps to take care of her children. Listen to both sides of the story and decide where you stand on the issue. Zack Zapatero describes what he saw when a Navy jet crashed into an apartment building in Virginia Beach, Virginia. 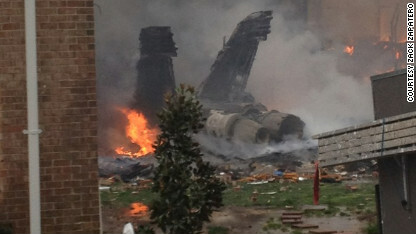 A witness describes what he saw when a Navy F-18 jet crashed into an apartment building in Virginia Beach, Virginia. 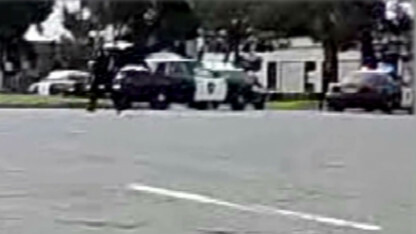 Watch the video to see the first images of the incident. Law enforcement expert Alex Manning analyzes a complete time line of the Trayvon Martin shooting, based on 911 calls. 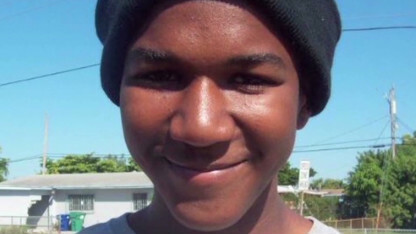 Hear the complete timeline of the Trayvon Martin shooting, based on 911 calls. Listen to the recordings that offer insight into Trayvon Martin's last moments and clarify George Zimmerman's final words on the night of the shooting. [Updated at 6:05 p.m. ET] A Navy fighter jet experienced a "catastrophic mechanical malfunction" during takeoff Friday over the military community of Virginia Beach, Virginia, and rained a stench of jet fuel shortly before crashing into apartment buildings, according to residents and Navy officials. The jet carried a student pilot in the front seat and an experienced instructor behind him, and the dumping of jet fuel was "one of the indications that there was a mechanical malfunction," Navy Capt. Mark Weisgerber told reporters. The two pilots, a police officer and three other people were taken to Sentara Virginia Beach General Hospital, Dr. Thomas Thames, the hospital's vice president of medical affairs, told CNN affiliate WAVY. None of the injuries was considered life-threatening, Thames said. In many ways, the "kill the head" speech by former New Orleans Saints defensive coordinator Gregg Williams sounds like typical pregame, fire-up-the-troops rhetoric, but former and current players say there are several instances where the now-suspended coach crossed the line. The speech has added new fire to an already scalding scandal in which the NFL alleges that the Saints administered a bounty program aimed at taking out opposing players. The day before the Saints' January 14 playoff clash with the San Francisco 49ers, Williams started his speech by instructing his team to never apologize for how they play. No big deal. Williams goes on to say, "Kill the head, the body will die," a twist on the frequent tutelage of boxer "Smokin'" Joe Frazier. It sounds nefarious given the recent attention given to concussions in football, but it could probably be written off as normal locker room bravado. Except, and this is a big except, Williams starts naming players by name, and what's more, he starts naming anatomy: tight end Vernon Davis' ankle, running back Frank Gore's head, quarterback Alex Smith's chin and wide receiver Michael Crabtree's "outside ACL." Former Detroit Lions cornerback Lamar Campbell, who retired in 2004, told the Detroit Free Press that Williams' speech began like many that Campbell heard during his playing days. Listening to it made him reminisce at first. Perhaps most disturbingly, Gregg Williams demands a big hit on kick returner Kyle Williams because of a recent concussion, something the New York Giants' Jacquian Williams and Devin Thomas caught heat for the following week when they said the same thing. "We’ve got to do everything in the world to make sure we kill Frank Gore's head," Gregg Williams said on the tape. "We want him running sideways. We want his head sideways." This could simply mean Williams wants his defense in the backfield so quickly that Gore has trouble getting upfield, that he wants Gore running east and west rather than north and south. Again, probably pretty typical of the instructions that defensive coordinators give to their men. Even Williams' invocation to "knock the f*** out of" backup running back Kendall Hunter isn't as bad as it initially sounds because he follows it with world-class hyperbole. Filed under: Football • Lawsuit • Louisiana • Pro football • Sports • U.S.
Augusta, Georgia (CNN) - While most of golf’s greatest players plied their trade on the grounds of Augusta National this week, one worked the parking lot in front of the nearby Hooters restaurant. John Daly, the winner of the 1991 PGA Championship and 1995 British Open, is spending Masters week selling shirts, hats and golf balls with his lion logo from tables set up outside his luxury motor home. It’s a strategy to connect with fans on two levels. “What sells I put on the website, what doesn’t, I don’t,” businessman Daly says of the display of wares. 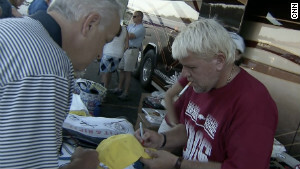 John Daly signs an autograph outside his motor home near Augusta National Golf Club. But buy here and you get to connect with Daly himself, and for golf fans it’s hard to resist the opportunity to get up close with the man who delighted them on the course. Malawian President Bingu wa Mutharika, once hailed as a positive steward for the southern African country, has died after a heart attack, government officials said Friday. 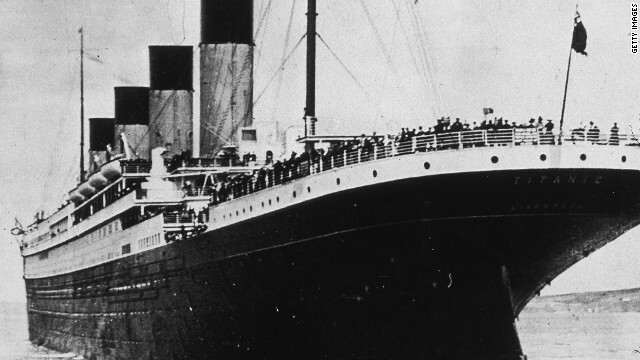 His body was flown to South Africa, the officials said. The former World Bank economist first became president in 2004 after campaigning as an "economic engineer," and was re-elected five years later. Hiring slowed dramatically in March, clouding optimism about the strength of the recovery, CNNMoney's Annalyn Censky reports. Employers added 120,000 jobs in the month, the Labor Department reported Friday, marking a significant slowdown in hiring from February, when the economy added 240,000 jobs. Meanwhile, the unemployment rate fell to 8.2% as workers dropped out of the labor force. Some say the race to the Republican presidential nomination is over, while others argue that it's not over yet. Watch CNN.com Live for all the latest news and views from the campaign trail. 10:15 am ET - Obama addresses women's forum - President Obama will deliver remarks at the White House Forum on Women and the Economy in Washington.